So today, I’m going to give you something from a race I consider quintessential shield users, the Dwarves. Their work with alchemically treated stone to create armor has been successful, but being the pragmatic people they are, they also wanted more protection to go with it. Enter the Stone Shield. A Stone Shield has all of the same properties as a Tower Shield (except cost), save that it is only the size of a Heavy Steel Shield and therefore cannot be set as cover like a Tower Shield can. Different varieties exist, some using a single piece of stone and others being made from interlocking stone pieces, but all function in the same way. The cost for a Stone Shield is 50gp. Dwarven Mastersmiths have also perfected a Shield Wall variant for use by their greatest heroes using a Stone Shield as its base. Not surprisingly, this shield also bears the name Stone Shield and so it can sometimes be confusing to non-Dwarves as to whether or not a particular shield is magical or not. 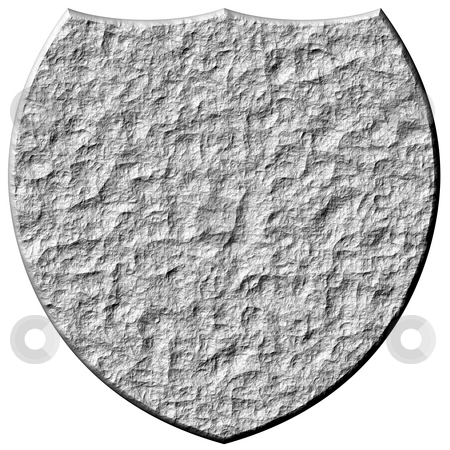 These shields come in many different varieties, the Stone Shield is described below. All Walls brought into creation by a Shield Wall can only be formed vertically and cannot be moved or pushed in any way. To create a Wall, the bearer must place the shield in front of herself at the midpoint of where she wants the Wall to be formed. The Wall then comes into being from a point touching the facing edge of the shield. A Wall always lasts for 1 round per Caster Level and cannot be dismissed early. Each Wall ability can be used three times per day, although any other abilities the Shield may possess are always active. Unless stated in the Description, they require a Standard Action to activate. A new Wall cannot be brought into existence until any previous Wall has expired. Slot shield; Price 93,720gp; Weight 45 lb. This shield is favored by Dwarven heroes and is made from a single piece of stone. It has the properties of a +2 Stone Shield (see above) and can be used to create a wall of stone as per the spell. It also has the Bashing and Light Fortification special abilities. It's Friday, so it's time for another Frightful Friday! monster. I happen to have a near-phobia with respect to clowns and spiders, and when I saw the first nightmare-fuel inducing image, I knew I had to make a monster for it (as one does). Thankfully, I thought, such a creature does not exist in real-life. Unfortunately, I was wrong, as the second image shows. 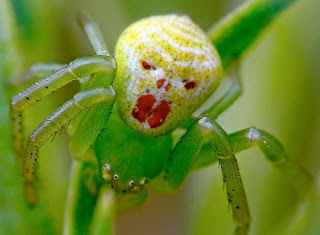 According to the information presented with that image, the real clown spider is only 5 mm long, but I don't think I'd care how big it was if I saw one. Today's entry was meant to be an April Fool's entry, but I ended up deciding to put this up on Friday for two reasons. First, it swerved into some fairly dark territory, as nightmares do. Second, Frightful Fridays! is taking over Mythopoeic Rambling for the A-Z blogging challenge (Monday through Saturday, that is. Flash's Sunderday feature will continue uninterrupted). I hope you, er, enjoy today's monster, and I'll be back on Monday with a much cuter, much less deadly "A" monster for you. Thanks for checking out Frightful Fridays! Speed 30 ft., burrow 20 ft., climb 20 ft. Languages Abyssal, Common, Gnome; telepathy 120 ft.
Manipulating Limbs (Ex) A clown spider can perform two combat maneuvers with its legs per round. This may only be done as part of a full attack. Poison (Ex) Bite; save Fort DC 23; frequency 1/round for 6 rounds; effect 1d4 Con and 1d4 Wis; cure 2 consecutive saves. The save DC is Constitution-based. Telekinetic Weaponry (Su) A clown spider telekinetically juggles various objects, one of which it can throw at a target as a free action. The spider makes a ranged attack, which deals 2d6 points of bludgeoning, piercing or slashing damage (clown spider’s choice). The attack has a 60-foot range increment. Additionally, if the spider disarms a foe, that weapon becomes part of the juggled objects, and it can select that weapon to throw (which inflicts damage and other effects per the weapon thrown). Wisdom Drain (Su) A clown spider can take a free action to drain 1d8 points of Wisdom from a victim suffering from its hideous laughter spell-like ability. This ability grants the creature 5 temporary hit points for each use. 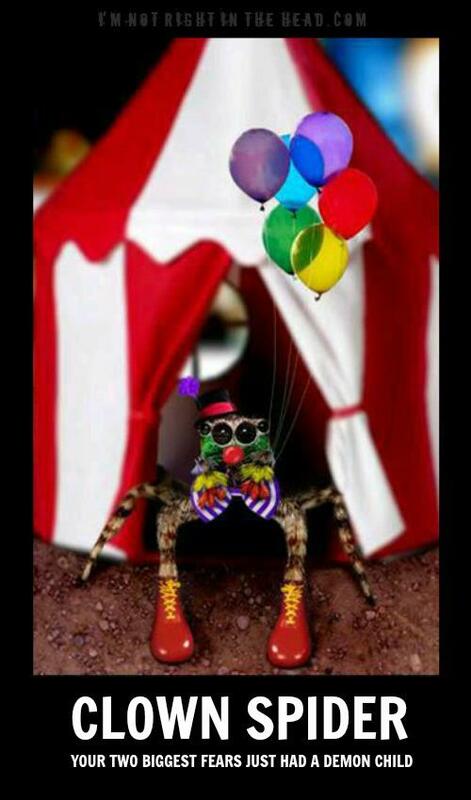 A clown spider is a purveyor of humor...at least as demons envision it. Those clown spiders who impress their demonic masters—usually in a gruesome display involving self-mutilation and the dismemberment of lesser demons—get permission to “go on tour” in the Material plane, where they inflict their deadly comedy stylings on mortals. A typical clown spider stands 2 feet tall, measures 4 feet in diameter (excluding its eight foot-long legs) and weighs 200 pounds. The arrival of a group of clown spiders is heralded by a coach pulled by lesser demons. A seemingly impossible number of the creatures emerge from the coach and set out to kill the location’s inhabitants—or drive them insane. A clown spider prefers to ensnare its prey with its spell-like abilities and to strip its prey of dangerous weapons that it then incorporates into its own telekinetically whirling circle of death. However, the spider will not hesitate to bite a foe who proves resistant to its attempts at mirth and merriment. As the cruelest joke, a clown spider uses its ability to temporarily resurrect a recently slain victim to force that unfortunate soul to another round of the spider’s depraved sense of humor. Inexplicably, a clown spider will leave gnomes untouched. It merely wishes to entertain gnomes with its macabre sense of humor, which usually targets non-gnomes in the audience. Worse relatives to clown spiders, prop comic spiders, are rumored to exist. Many times, one of these creatures takes the blame for a village that looks like some weather-related disaster hit it, even though no severe storms had actually struck. They just roll around so quickly! This week I'm gonna give you a bit of Druid love. No... wait,don't have me hauled away by animal services, not that kind of Druid love! Before Ultimate Equipment, Druids suffered a bit in the armor department but now they have a few more choices available to them they're not as restricted (well except by the exorbitant cost of the Wild special ability!). I know the Shield Walls are a bit on the simple side and spell-in-a-can-ish but I think they make for an interesting spin on the use of shields and can make a melee character much more versatile. So without further ado, I give you the Thorn Shield! These shields come in many different varieties, one of which is described below. Slot shield; Price 82,200gp; Weight 10 lb. This +1 Light Spiked Greenwood Shield is primarily made and used by Druids. It has long thorny protrusions covering it and can create a wall of thorns as per the spell. It also confers the Wild special ability. It's Friday, and that means another frightful entry, based on yet another real-world creature. 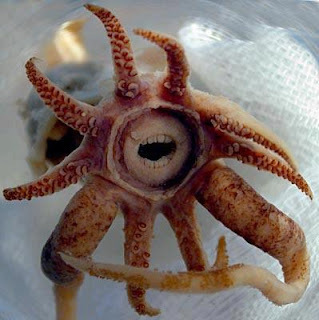 This is the promachoteuthid sulcus, a recently discovered member of the squid family. It has a weird, creepy facial expression, so naturally I decided to create a powerful yet helpful denizen of the seas out of the inspiration. Hopefully, your characters will befriend the promachoteuthid guardian once they realize it doesn't actually mean any harm. That's it for this week. I'll be back next week with the most frightening mash-up ever, and then beginning on April 1st, Frightful Fridays! expands beyond its Friday remit for the month of April. As always, thanks for reading! This light-brown squid turns and reveals an unsettling smile amid its array of tentacles. Speed 10 ft., swim 80 ft., jet 240 ft. Positive Energy Ink (Su) Twice per day, a promachoteuthid guardian can release ink charged with positive energy. The creature can choose to heal all living creatures (excluding evil aberrations) or damage all undead or aberrations (excluding good aberrations—luckily for aquatic flumphs!) in a 120-foot cone. The promachoteuthid guardian heals or inflicts 19d6 damage with this ability. Not everything in the world’s oceans and seas is out to kill those brave enough to explore them. A promachoteuthid guardian occasionally travels to Prime Material waters to thwart the machinations of a dread kraken or other underwater menace. The creature is bodily smaller than the typical squid specimen, measuring six-feet in diameter, but it makes up for that with lengthy twelve-foot tentacles. Overall, the creature weighs roughly 400 pounds. Ancient relatives of the promachoteuthid guardian emigrated from the Prime Material plane to the Elemental Plane of Water through a random portal that opened between the two planes. There, the creature evolved into its current incarnation, developing an incredible amount of intelligence as well as an unusual beneficence. A single promachoteuthid or a mated pair will travel to the Prime Material plane—and more dangerous planar waters—to perform acts of mercy and rid their adopted worlds of great aquatic evils. The creature crusades against sharks, sahuagin, and the occasional aboleth or dread kraken, and assists those who wind up literally over their heads in vast open stretches of water. The creature lives for several centuries and usually spends 50 years (or more) at a time patrolling its assumed home; once it is satisfied with the conditions there, it returns to the Elemental Plane of Water. Characters may add promachoteuthid guardians to the list of summonable creatures in summon monster IX or summon nature’s ally IX. Greeting once again fellow shield lovers and welcome to this week’s Sunderday installment. I’m a lot late this week because I um... actually forgot all about it! I was so tired that I went to bed early on Sunday night and it completely slipped my mind. Whoops! Continuing on from last week's double feature, this week I’m giving you another Shield Wall, but since this one is a swift shield I’m going to make this post nice and quick like my namesake. So without further adieu I give to you the Force Shield! These shields come in many different varieties. Slot shield; Price 66,990gp; Weight 10lb. 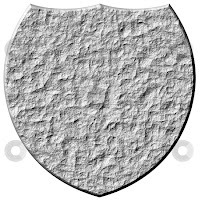 Despite its thin, fragile appearance, this +3 Heavy Mithral Shield is actually quite sturdy and can be used to create a wall of force as a free action. Hello Frightful Fridays! fans. Today's entry presents the first construct for this feature. When Paris pointed this out, I knew I had to work up something for Frightful Fridays! Paris also mentioned that someone on one of the shared Facebook posts referred to these as "clockodiles." Admittedly, I couldn't come up with a better name for them, so I...borrowed it. I hope you enjoy this week's entry! I'm still working away on April's FF! festivities, but I'll be back next week with a new monster. Have a great weekend! The creature, fashioned to look like an ordinary crocodile, is constructed of metal sheets and gears, a pair of which makes the creature’s jaws more powerful than those of the creature it mimics. Disease (Ex) Tetanus: Bite—injury; save Fort DC 15; onset 1d3 days; frequency 1 day; effect 1d4 Dex damage; cure 2 consecutive saves. The save DC includes a +2 racial bonus. Locking Jaw (Ex) When a clockodile grabs an opponent with its bite, it has a +8 circumstance bonus to its CMD against attempts to break the grapple. Additionally, if a clockodile is destroyed while it has a grappled opponent, it still constricts its grappled foe on its next turn, after which it releases the opponent. A clockodile hails from an alternate Material plane where constructs have evolved as the dominant life forms. While the sentient constructs seem to have no designs on this plane, occasionally an errant animal-like predator like the clockodile slips through a portal and wreaks havoc. The creature is 15 feet long and weighs 2 tons. A clockodile hunts in a much more straightforward fashion than its flesh and blood counterpart. Rather than lurking along river banks, the clockodile charges its foes and bites down on the first accessible victim. Its gears lock into place to hold its victim in a vise-like grip, squeezing the life out of the unfortunate soul, while the clockodile uses its tail to keep any of its victim’s potential allies away. The creature does not require food to survive; its attacks arise from its aggressive nature, which strengthens as the creature takes more and more damage from which it cannot naturally heal. A handful of arcane casters have reverse engineered the clockodile, but it does not have even the animal intelligence of the “natural” creature. A constructed clockodile loses its Intelligence, and its Intimidating Prowess and Skill Focus (Perception) feats. 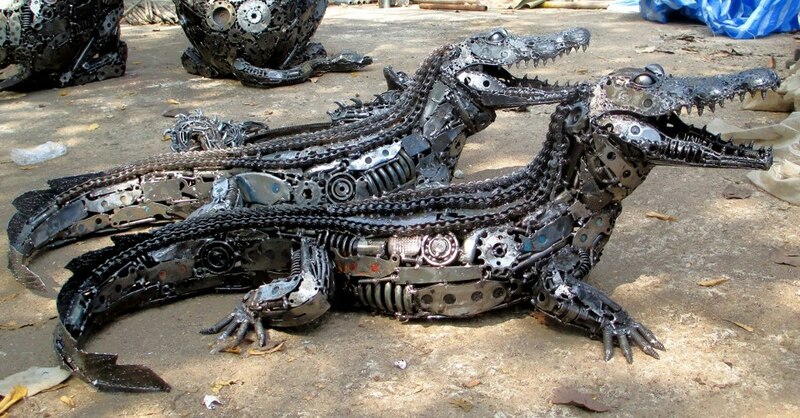 A clockodile’s body is built from 4,000 pounds of iron or other suitable metal. Gary made me do it. Okay, not really. 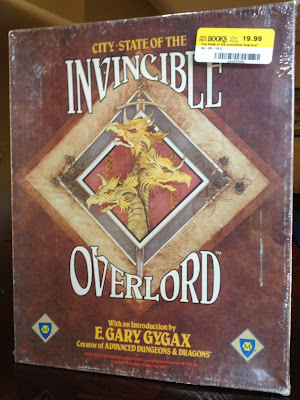 I'd also heard some good press on the the 1987 Mayfair boxed set recently, (Save or Die!? THACO's Hammer?) 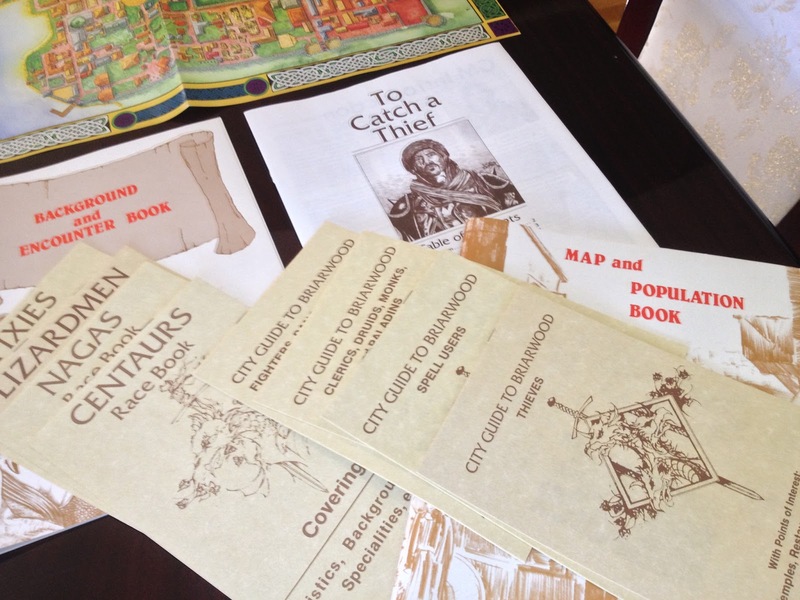 although, with the annoying implication that Ed Greenwood ripped off CS for Waterdeep. Perhaps the original JG products influenced later city products. 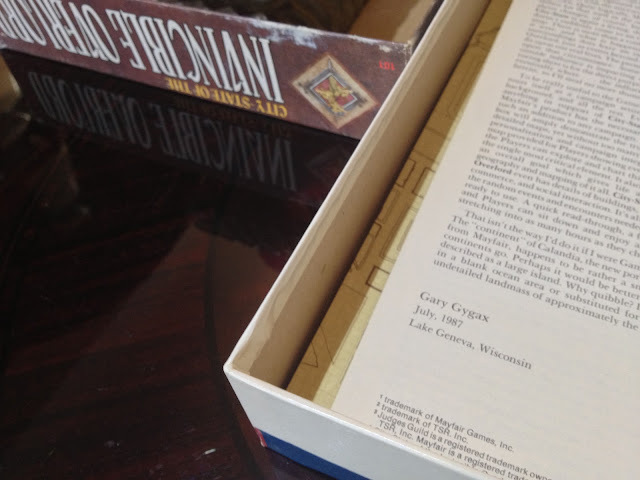 Waterdeep & the North came out the same year as this boxed set, and City System is only a year later and much more ambitious. Oh well, it was probably just DM Glen mouthing off. 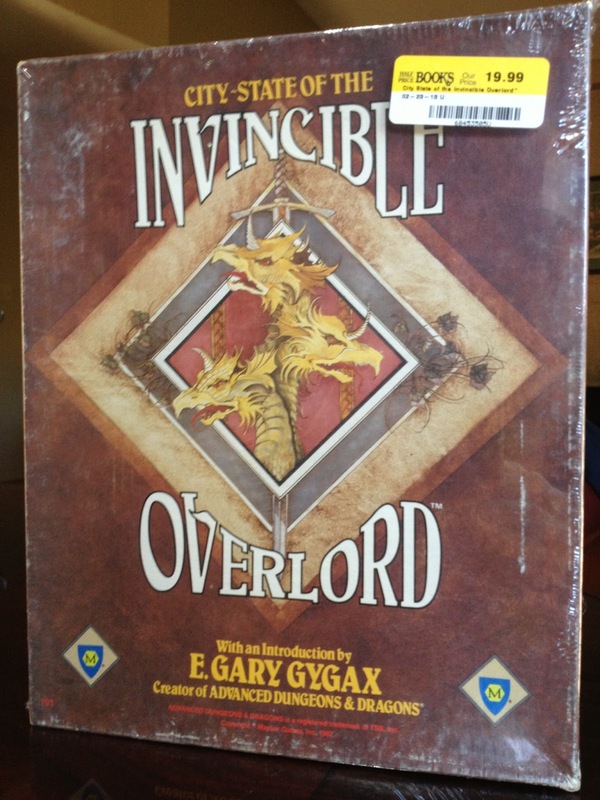 So: today at Ye Olde Halfe Price Bookes on 40% coupon day, I came across a box in good shape, $12-13 seemed like a good risk, and everything was indeed inside it. I also thought this deal was much more realistic than to think I would ever stumble over the JG pieces at anything resembling a non-crazy collectible price. The box is in much better shape than the box sets I usually find, and I was intrigued by the four added races. I'd have to modify centaurs to be like the early Greek originals, however, as the four-legged variety seem just too much for a PC race. In response, what words of inspiration or experience do my fair ramblers have for me on City-State? Merry Sunderday to All and to All an on time morning! Today I’m going to introduce you to a new sub-group of magical shields I developed, the Shield Walls. Each one can be used to create a certain type of Wall spell and most have other abilities that thematically link into the type of Wall they create. Over the next few weeks I’ll give you a new Shield Wall, but for this post I’m going to let you have two, since it’s hard to separate these two from their thematically linked elements. Enjoy and as always I hope you get as much enjoyment from using them as I did creating them. These shields come in many different varieties, two of which are described below. To create a Wall, the bearer must place the shield in front of herself at the midpoint of where she wants the Wall to be formed. The Wall then comes into being from a point touching the facing edge of the shield. A Wall always lasts for 1 round per Caster Level and cannot be dismissed early. All Walls use their Caster Level to determine their dimensions and other properties (such as damage). Each Wall ability can be used three times per day, although any other abilities the Shield may possess are always active. Unless stated in the Description, they require a Standard Action to activate and a new Wall cannot be brought into existence until the previous Wall has expired. Slot shield; Price 56,400gp; Weight 15lb. This red hued +2 Heavy Steel Shield is always warm to the touch. It can create a wall of fire as per the spell. It also grants its bearer Fire Resistance 10. The shield must be held for this ability to be active, although being strapped to the bearer’s back does count as being held. Slot shield; Price 56,400gp; Weight 6 lb. This light blue +2 Light Steel Shield emits a frosty vapour in a warm environment and is always cool to the touch. It can create a wall of ice as per the spell. It also grants its bearer Cold Resistance 10. The shield must be held for this ability to be active, although being strapped to the bearer’s back does count as being held. P.S. Anybody should feel free to share your thoughts on any of my shields, especially on how you’ve used them in game and tied them to your characters. Welcome again to another Frightful Fridays! Thanks to Paris Crenshaw for his awesome armored cricket last week, while I took the time to work a little bit ahead on my April plans. I'm back this week with a new kaida, the leaf kaida. I believe this would be a perfect familiar for an arborling, who would naturally be able to bond with one of these dragons. I hope you like the third kaida in the series, and I promise a few more in later Frightful Fridays! installments. Have a great weekend! 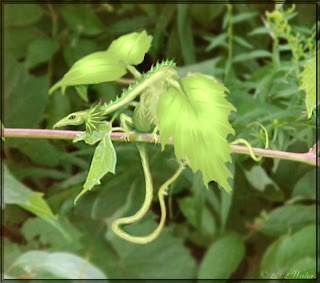 What at first appears to be a couple of leaves attached to a tree’s stem reveals itself to be a little dragon with deciduous leaves as wings. Poison (Ex) bite; save Fort DC 12; frequency 1/round for 4 rounds; effect 1d2 Dex; cure 1 save. Unlike other kaida, the leaf kaida protects the forest domains it calls home. When at rest, this dragon is nearly indistinguishable from a couple of leaves attached to a tree, and it can even go so far as to mimic the stunning colors seen during autumn. This camouflaging process is not fast enough to provide the dragon any real benefit, though. A leaf kaida measures roughly 2 feet in length, and it has a relatively short wingspan at 6 inches. In keeping with its leafy nature, the creature weighs less than a pound. A leaf kaida chooses a tree to bond with—a process that takes a full 24 hours to complete. It lives with the bonded tree in a symbiotic fashion, providing protection to the tree, while its host provides nourishment to the kaida. The kaida stays with the tree throughout the year, even during winter whereupon the dragon’s leafy features seem to shrivel and brown. As long as the kaida stays with its tree it stays healthy; on the rare occasions the creature must depart from its tree (during mating season, for example), it can remain separated for a week, after which it sickens and eventually dies. Typically, if something prevents the kaida from returning, it attempts to find another plant with which it can bond. Through its continual bonding and re-bonding actions, a leaf kaida can live for over 200 years. A fairly robust and long-lived tree can host dozens of leaf kaidas; treants and dryads are especially fond of the dragons, who, in turn, appreciate the other creatures sharing their homes (or bodies, in the treants’ case). A spellcaster can choose a leaf kaida as a familiar. The spellcaster must be at least caster level 6th, be able to cast 1st-level druid spells, have the Improved Familiar feat, and provide a Small, or larger, plant with which the leaf kaida can bond. As a familiar, the leaf kaida can stay away from its bonded plant for one month at a time, but afterwards it must succeed at a Fortitude save (DC equal to 10 plus 1 for each day away from its plant) or perish. Happy Sunderday (just) to all!